I’ve always been a fan of smokey flavors and of course, when I was not Vegan, I’d love to enjoy lox and bagels for breakfast. In the plant based world, we obviously can’t have lox, and I needed a way to get those savory flavors into my morning routine again. At first, I tried to use some liquid smoke into a vegan cream cheese, and while that was good, I just wasn’t truly satisfied with the flavors of it. It just seemed kind of fake to me. I then stumbled upon Tofutti Brands Sour Cream. Yes, “Sour Cream.” I realized that it was shockingly more accurate to cream cheese than anything else. Oddly enough, Tofutti makes a cream cheese, but honestly, it doesn’t taste nearly as good as their Sour Cream! I then proceeded to deconstruct what makes lox and bagels so good, and it’s definitely the smokey flavors, but also the fresh dill, onion, and capers. These flavors traditionally melt together to make a perfectly balanced, savory dish. In this video, I smoke the cream cheese with a portable smoker and pack it with all the flavor notes discussed above. 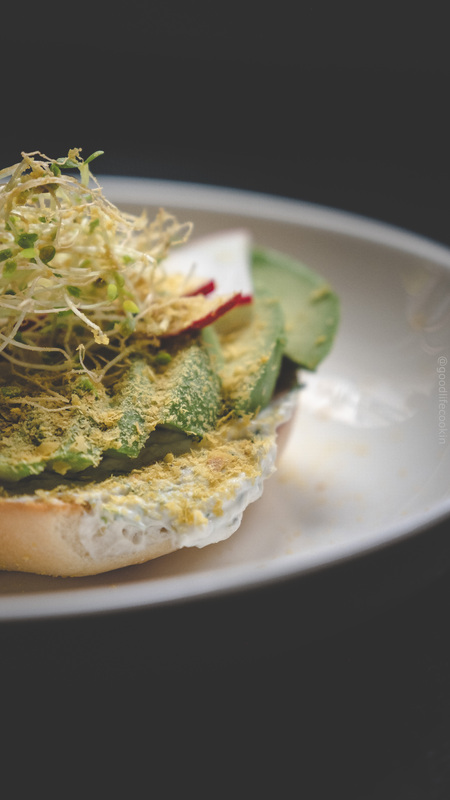 I also take more creamy textures found in avocado, lay that over the bagel, and cut all the richness with some fresh sprouts. Infuse your Vegan cream cheese, with smokey goodness and savory flavors. Finely chop capers and dill. Place in small mixing bowl with Tofutti Sour Cream. Add onion powder, olive oil, salt, lemon juice, and fold together. Cover with wrap when done. Prepare portable smoker with wood chips. Create small hole in wrap on bowl and place smoke inside bowl. Let stand for 2 minutes, covered. Give final stir when cheese has finished smoking. Slice avocados and add over bagel with cream cheese. Top with sprouts, sliced radish, paprika, and nutritional yeast to finish. I’ve never used a smoker and have no clue what to look for if buying one. Please share some info that would help me move to this next level. This recipe sounds delicious and your approach seems quite thorough. You’ll want to grab this portable smoker – https://www.amazon.com/Gourmia-GSM160-Portable-Infusion-Enhance/dp/B01LZ8I8Z5? You’ll also want to grab some woodchips – I use these – https://www.amazon.com/Breville-Mesquite-Applewood-Cherrywood-Woodchip/dp/B07168H4SG/ref=pd_sim_79_1? Let me know if you have any other specific questions. It’s really easy to use. Thanks so much! How clever!! Dyed in the wool vegan. Hope there are a few vegan recipes that take smoke taste cause it’s on the way to me! Thanks so much. Looking forward to making your recipes.